When I read this story I was a little freaked out as this is a very creepy and a very bizarre mystery. And I really wanted to let you guys known about this. In a small town in Mexico there is a mannequin or an alleged mannequin that has been on display in a small store window for about 86 years. Which is a very long time for a store to keep the same mannequin on display. Only adding to the credibility of what many people believe. Now this mannequin made its day view in 1930 on march 25th. And right away it became very popular as the townsfolk would just stop and stare at it because it looked exactly like the female shop owner. And it’s also very, very pretty and very well done. So It must have been made by someone very professional, as it looks almost identical to this women. Now what many people didn’t know at that time is the shop owners daughter who looked very similar to her died on her wedding day by a spider bite, a black widow. So we can only imagine how devastated and heartbroken the mother and her would be husband were. And not to long after her death this mannequin appeared in the front window of this store. And once the people within this town found out about her deceased daughter they started to believe that this mannequin was not a mannequin at all. They believed that it was the corpse of her dead daughter. 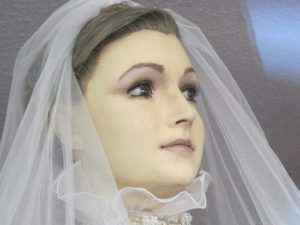 And another strange thing is this mannequin is wearing a wedding dress, which is kind of freaky as she did die on her wedding day. And once this story started to spread people from all over started coming here in droves so they could find out for themselves if this was a corpse or a mannequin. And many believed without a shadow of a doubt that this was not a mannequin but a corpse. So most were outraged by this and they demanded that the shop owner remove it at once and give this poor girl a proper burial. But the mother, the owner of the shop insisted that this was not a corpse but simply a mannequin that she made in honor of her dead daughter, as she was very heartbroken as she missed her very much. But do to the fact that it looks just so real they still didn’t believe here. But there was nothing more that they could do about as they couldn’t prove that it was a dead body. Now here is where things get a little creepy. Not to long after this mannequin or corpse was placed at the front of this window some very strange and pretty scary stories started to come forward. It was said by many eye witnesses that the husband, or the would be husband would enter into this shop at night and start talking to her. And these eye witnesses swear that she would talk back and return back to life. And some even say that they had seen on several occasions them dancing together inside the store. And It’s also said that from time to time this mannequin would change positions throughout the day. Either her body would move or her eyes would change directions. And this really freaked everybody out. So needless to say this mannequin started to get very, very famous. And people would flock from all over Mexico to see if they could witness any of these supernatural events. And she is still there, in front of this window to this very day. And this mystery is only getting more and more famous throughout the world. Even the people who work here believe that something paranormal is going on here. And they do not like to be left alone within this store. So they all try to arrive and leave at the exact same time. As they are terrified. One of the employees even stated that every time she goes near it her hands and her body start to sweat. And she can even see veins within its legs, and even its finger nails looks real. And this employee as well as many others truly believe that it is a real person. But professionals say that it’s impossible to keep a deceased person that well preserved for such a long period of time. But for the ones that see it up close and personal disagree. Making them wonder how the original shop owner was able to pull something like this off. So if your ever in this part of Mexico I would strongly suggest to go check out this mannequin or corpse and let us know what you think?